Delivery in the Continental U.S. only. This item is shipped separately by the manufacturer and may take up to 5 business days for delivery. Trust us - it�s worth the wait! No shipping available outside the 48 states or to APO addresses. Note: After your order is placed you will receive an email to set up a date to have your Egg Whites delivered. After 3 days, if no response is made to the initial email, Egg Whites International will call to set up delivery time. Please keep this in mind when placing your order. The reason for this is due to the fact that the egg whites are refrigerated and need to be kept cold. Your order can NOT be shipped until a delivery date is scheduled. Note that ordering the 2 Gallons is about 20% cheaper than ordering the 2 Half Gallons twice. However, the VERY BEST VALUE is the 4 Gallon Case. This is about 10% cheaper than ordering the 2 Gallons twice. Our brand is custom designed as a drink. They have been double filtered to remove all the slimy texture so they are as smooth as milk. You can take a cup of our egg whites and add chocolate flavor or 1/2 of a serving of your chocolate protein powder and they taste like chocolate milk. They also make the fluffiest omelet you have ever had. Despite the fact that this is the #1 most bio-available bodybuilding protein in the entire world, 80% of our customers are all trying to lose 10 to 20 lbs. Our average customer drinks an 8 oz cup in the morning, sometimes with 1/2 cup of cold coffee, and 1/4 of vanilla creamer, for an iced coffee. They are getting 26g of pure protein with only 2 carbs, 120 calories, no fat and no cholesterol. Then they also drink an 8 oz cup right before bedtime. You can use any flavor you like. These 2 drinks added to your already 3 meals a day, help our customers potentially lose up to 2 to 3 lbs a week of fat, if they are smart about the other 3 meals they eat throughout the day. They are NOT a RAW egg white. They are low heat pasteurized to remove ALL bacteria, including Salmonella. The low heat pasteurization also neutralizes the Avidin. Avidin is found in a raw egg white, and can block your Biotin uptake, causing a vitamin deficiency and health issues. These are specially designed to be safe to drink. They are specially filtered to remove all the slimy texture, so they are as smooth as milk. They will make a fluffy omelet, but you denature or burn off some of the protein when cooking them. So by drinking them, your body has more usable protein available to absorb, and they are lighter on your stomach. Lactose free, Gluten Free, Fat Free, Cholesterol Free, Non GMO, USDA, and Kosher approved. All natural fed chickens. They are 100% Pure Liquid Egg Whites. Real Food Protein that is as clean as it gets. No additives or preservatives. As an All Natural, Real Food drink, they are more bio-available than protein powders. Most protein powders can only support muscle for 2 to 3 hours, and they are incomplete proteins. 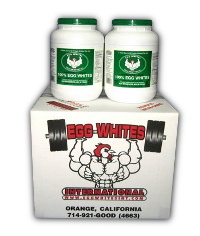 Our liquid Egg Whites are a complete protein, with entire essential Amino acid profile. They are 100% Bio-Available, and support muscle for up to 4 to 5 hours. They are the perfect complement to mix with your protein powders, and you can get twice as many servings from your powder. Simply use � the recommended serving of powder, and mix with 1 cup of our liquid egg whites in place of water or milk. Your body will absorb about 30% more protein per drink, using half the powder, for up to 2 hours longer muscle support, and you will get twice as many servings out of your protein powder. You can't taste them in any drink! Take a cup of our egg whites and simply add chocolate, and it taste eggs-actly like chocolate milk. REALLY! Even your kids won't know the difference. See our website for lots of drink ideas. PERFECT Protein for children. Better food, Better Behavior. We are proud to be a recommended food by the Feingold Association for the Feingold Diet to help families with hard to raise children with ADHD and other related behavior problems. Take a half cup of our liquid egg whites mixed with half cup of milk over cereal. Kids have No Clue! World�s Best Protein for a Weight Loss, Bodybuilding, Vegetarian, and Paleo Diet.... You name it! Bariatric patients with limited stomach space from a Gastric Bypass or Lap Band Surgery, can get 26g of protein in just one cup. Zero Fat, Zero Cholesterol, 2 carbs, and only 120 calories. This valuable protein will give them the building blocks needed to support weight loss. In most cases patients are required to go on a diet before the surgery to be healthy enough to have the surgery. This product is perfect for both before and after the surgery. People who just need to get more protein in their diet but don�t have the time or appetite to eat solid foods throughout the day. Now you can take a cup of our liquid egg whites mixed with anything you like to drink and you�re getting the same amount of protein as a 10 egg white omelet! 1/2 Cup = Average Omelet (5 egg whites) 1 oz or 2 tbs. = approx.1 egg white 1 oz or 3 tbs. = approx. 1 whole egg Suggested Drinks: Fast and Easy 1 Cup (approx 10 egg whites) 1 scoop of your favorite powder. Shake well. You can't taste the egg whites! You can also mix with juices. Can be kept frozen. Shake well upon defrosting. * These statements have not been evaluated by the Food and Drug Administration. This product is not intended to diagnose, treat, cure, or prevent any disease.